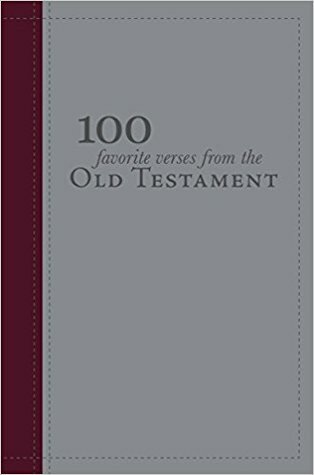 My attention was grabbed when I read the part of the book description for 100 Favorite Verses from the Old Testament that said "truly understanding the Old Testament". I read the Old Testament years ago as part of a seminary class, and several years after that I attempted it on my own. However, I was so put off by what I couldn't understand that I soon gave up. When 100 Favorite Verses from the Old Testament arrived in my mailbox I was very surprised to find a 200 page book. Although I wasn't anticipating two pages per verse (I'm not sure how else you'd understand the verses without some good explanations-I just hadn't thought that part through), I was very impressed with the look of the book. It is a lovely, stitched leather (faux?) hardcover with debossed titles and silver gilded pages. It will fit very well next to your scriptures. This isn't a one sitting kind of book. It's a study guide of sorts, or maybe something you'd use for family nights or devotionals. My goal is to read a chapter a day (so one verse and explanation per day), and it has been an enjoyable experience so far. The author gives some great insights, and there is definitely food for thought. First off, this book! It is so nice looking - almost elegant, really. Second, while I haven't finished the whole book yet, I am very pleased with the presentation so far. I really struggle with scripture study, especially in the Bible, because I have such a hard time understanding what a lot of the scriptures even mean. As a result, I have purchased several styles of scripture help books. Many of them I've ended up reselling or donating, because they just didn't give me the additional help that I need to gain some great scriptural insights. I think this one will be a keeper though. I really like how the author focuses on one scripture at a time and then spends two pages talking about it, linking other scriptures to it, and giving some great insights. This is not a book that is best read in one sitting. This is something that I have added to my daily scripture time, and I read/study one verse a day, along with my other reading that I'm doing. This is a small enough book that you can take it with you and pull it out to read when you're waiting for carpool pickup, in line at a store, or at the doctor's office. I'm very happy to add this book to my collection.